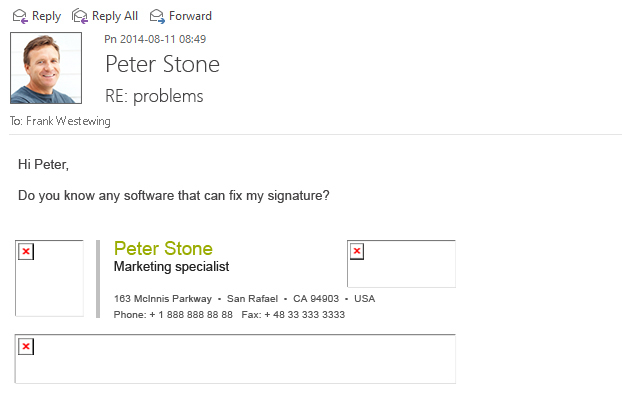 These days a good-looking email signature seems to be an essential part of any business. More and more companies want to create a professional-looking signature as they know that it can tell the recipient a lot about the organization depending just on the way it is presented. Below you can find some guidelines on how to create a professional-looking business email signature. Of course, in the signature, you should put all the necessary information such as first name, last name, job title, mobile, email address and/or website, your company’s logo and social media buttons linked to most popular portals. It seems to be overwhelming when the signature consists of more information than just mentioned above. It is recommended to avoid many images placed all over the signature – it may be distracting and for some people even annoying. Making use of some uncommon fonts may be troublesome. Let us assume that you want to create a signature that is special and stands out from other companies’ signatures. To achieve that you decide to use one of those fancy fonts instead of the safe ones. Please don’t do that. Why? There is a greater chance that the recipient of your email will not have this font installed on their computer. Effect? 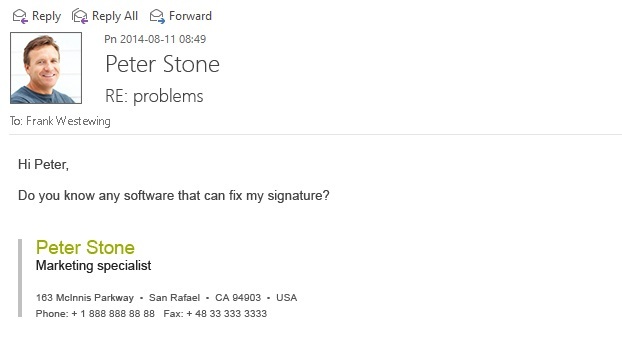 The signature, instead of being outstanding, looks really bad or the email client changes the font to a standard one as the one you have chosen is not available on the recipient’s side. In long e-mail conversation strings, it may be inconvenient to use the full composition of your signature. In reply/forward messages, it is better to keep the signature as short as possible. One of the advantages is that you do not need to scroll down through the whole conversation chain trying to find a piece of information hidden somewhere between signatures. That is why, for replies and forwards, it seems to be more than enough to include just your first name, last name and job title (optionally mobile can be included as well). Can you imagine a worse thing than the image not displaying properly in your signature? Unfortunately, this seems to be a quite common problem, especially when images are inserted from the local disks. A simple solution for that is to choose an online resource as the storage for your signature image and provide an URL of that picture. Thanks to that, you can be almost sure that the image will be displayed correctly on the recipient’s side. It sounds obvious but not for all. Sometimes we allow the employees to create their own signatures which are added directly at the sender’s side. In small companies, it may not be considered a huge problem but in big organizations it can be troublesome to control everyone’s signature in order to stick to the standards. That is why more and more companies decide to manage signatures centrally to have a full control over their corporate visual identity. Microsoft Exchange server users, for example, can achieve that by adding a transport rule directly on the server. However, as native signature solutions have some limitations you can consider using a third party tool like CodeTwo Exchange Rules (for Exchange Server) or CodeTwo Email Signatures for Office 365. This entry was posted in Microsoft Exchange Server 2013, Microsoft Office 365, Microsoft Outlook 2013 and tagged best practices, business email signature, email signature guidelines, exchange, office 365 on July 30, 2015 by Milena Szyrwiel. Good examples. Thanks for sharing Milena. I would add to a best practice, is to have head shots similar to the ones in the examples above and not a picture of your favorite football team, your dog, or a Disney character. You just sent them an email. Why do you need to give them your address? You certainly do not need to include the email address, but there are a few reasons to do this. The most important is that when someone forwards your message, most email clients do not include your email address anywhere. Furthermore, your email signature can include another address, for example, a common “sales@your-organization.com”. This way, if someone has an urgent matter, they can use all means necessary to reach your organization, especially when you are out of office. Would like to inquire – how if there is an visual? Should it be before the signature or after? It depends solely on your preferences. In most cases, visuals are added before the signature. 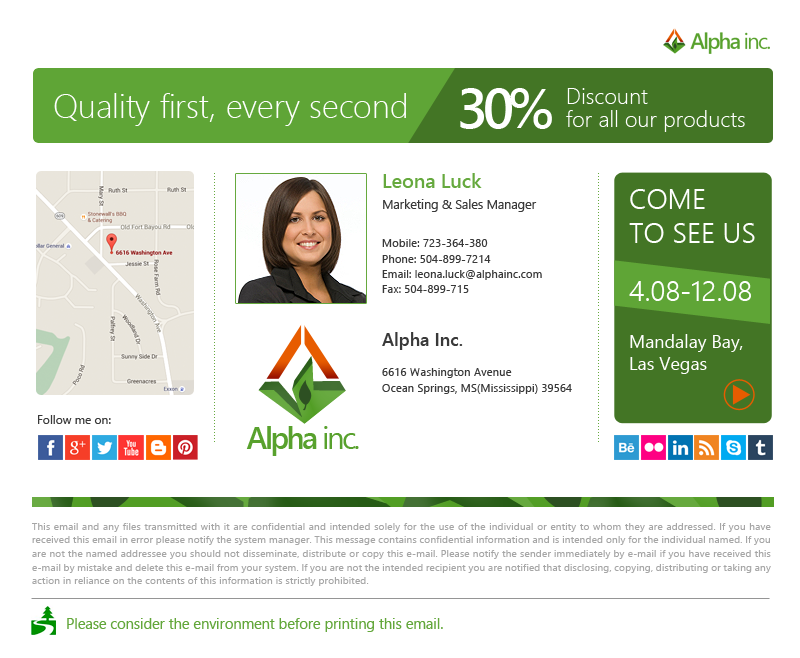 This way, the visual will look like an integral part of your email. Usually, the area below your signature is where disclaimers are added. That said, I do not see a reason not to change this default setting.